I am working on Bloody Lessons, the third book of my historical mystery series, which means I am wrestling once again with how adequately and accurately to portray the past, in this case 1880 San Francisco. This led me to the idea of describing some of the tools I used in creating the historical background for my protagonist’s home, which appeared first in Maids of Misfortune and will continue to play a role in all of my books, a boarding house in the 400 block of O’Farrell Street of San Francisco, between Jones and Taylor. First of all, as Susanne Alleyn points out in her clever and very readable book, Medieval Underpants and Other Blunders: A Writer’s (and Editor’s) Guide to Keeping Historical Fiction Free of Common Anachronisms, Errors, and Myth, an author of historical fiction needs to recognize that the city of today can be vastly different from the city of whatever time period you are writing about, and this is true even when you are talking about a relatively young city like San Francisco and a time period that is only 132 years in the past. Sometimes cities change for man-made reasons. Street names are changed, new streets laid out, hills graded, wetlands filled in, residential areas become commercial and commercial areas become residential, and railroads, subways, and freeways are built, destroying existing property. Neighborhoods change, expand and contract, and sometimes disappear. And then there are natural disasters. Hurricane’s Katrina and now Sandy have demonstrated the ability of natural forces literally to obliterate areas, wiping the structures, even the ground the structures are on, off the face of maps. Sometimes these streets and blocks are rebuilt, sometimes they are not, but a good historical fiction writer of the future, setting their stories in New Orleans or New Jersey shore towns anytime after these disasters, will have to take the impact of these disasters into consideration. In short, I needed to take both man-made and natural disasters into account when I set Annie Fuller’s boarding house in the 400 block of O’Farrell Street to make sure that the street existed in 1880, that it was an area of the city that would have had a boarding house, and that the physical environment would be the same (grade of the hill, etc). So, how did I determine this was an appropriate place to put the house, particularly since I wanted the house to have been built in the 1850s when Annie Fuller’s aunt and uncle first settled in San Francisco? As Alleyn recommends, I started with historical maps. Sally Woodbridge’s San Francisco in Maps and Views, was most useful. O’Farrell Street did not exist in 1847, but it existed by 1852, as determined by a series of surveyor maps of the city streets, and it was named for the first surveyor and map-maker for the city, Jasper O’Farrell. In 1852, however, there were no buildings past the 100 block of O’Farrell. Yet, by 1859, another map shows at least three structures existed on the south side of the 400 block, making it historically accurate for me to write that my protagonist’s house was built in the mid 1850s. In addition, since the block was so sparsely built up at the time the house would have been built, I was able to a create a house that was a little wider and in a different style than the narrow Italianate houses that would come to predominate in the 1870s and 1880. I used this fact to help me determine that the house would be constructed in the Greek revival style, which was briefly popular in the 1850s, and in my second book in the series, Uneasy Spirits, I used that fact to support the rather large back yard to the boarding house where a Halloween Party was held. According to historical maps and histories of San Francisco, by 1879, when my first book opens, the streets north of Market and between Van Ness and the financial district to the east were built up with a variety of residential and commercial buildings representing a variety of architectural styles. For example, see Burchell’s The San Francisco Irish, 1848-1880. O’Farrell Street was no exception. Obviously one of the ways I could try to get a feel for what the block was like in 1880 would be to go look at it today, hoping that some of the buildings are still standing. However, this isn’t possible because in 1906, between the earthquake and the fires that came after, the 400 block of O’Farrell, along with most of the buildings east of Van Ness, were destroyed. After reading a detailed account of these fires, it looks like the 400 block may have been spared the first day after the earthquake, but the afternoon of the second day, April 19th, it was engulfed by blazes coming from all directions. If I wanted to get a feel for what Annie’s boarding house would have looked like in 1879-1880, I was going to have to do more research. Census records (which I had analyzed for my dissertation) gave me information about the size of homes and boarding houses in this part of the city in 1880, and newspaper classified ads not only confirmed that there were boarding houses in this residential area (including on O’Farrell Street), but also gave me a range of prices people were paying for room and board. This all helped me plan the size and number of servants and boarders that would be found in her house. Architectural histories of the city told me what styles predominated in the 1850s, when the boarding house on O’Farrell was supposedly built. See for example, Kenneth Naverson’s West coast Victorians: A Nineteenth-Century Legacy. In addition, photographs of the city in the 1870s and early 1880s were another enormously helpful source, confirming what I had been reading about. For example, this picture shows how residential and commercial buildings of every shape and style could be found in houses in the same neighborhood in the 1870s. One of the most useful historical sites on the internet links historical photographs by time and place on a map of the city, so you can begin to see what the neighborhood looked like over time. Since Annie Fuller’s Uncle Timothy, the man who built the house she inherited, was a successful businessman, he would have made improvements in the original 1850s house, including the installation of a bathroom on the second floor, upgrading the woodwork, and putting in new wallpaper and furnishings. I consulted books such as Victorian Interior Decoration: American Interiors 1830-1900, In the Victorian Style, and a wonderfully illuminating book, Death in the Dining Room: And other Tales of Victorian Culture, to help me determine what Annie Fuller’s boarding house would have looked like by the time she inherited it in 1878. While Susanne Alleyn cautions historical fiction authors about depending on historical movies as sources, a well-researched movie can provide a useful visual impression. 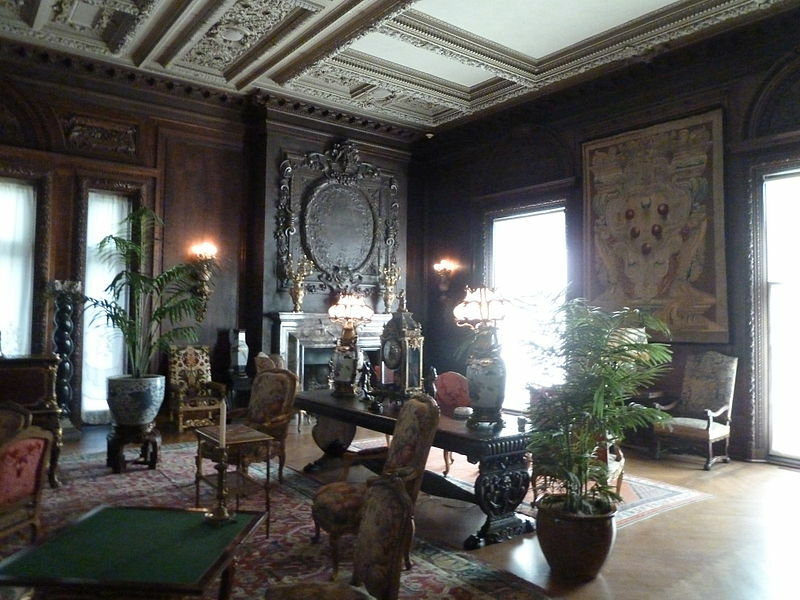 For example, the 1993 movie based on Edith Warton’s Age of Innocence, and the companion book that compares stills from the movie to paintings of the period, were wonderful sources, although the movie portrayed much wealthier interiors than would have characterized Annie Fuller’s boarding house. 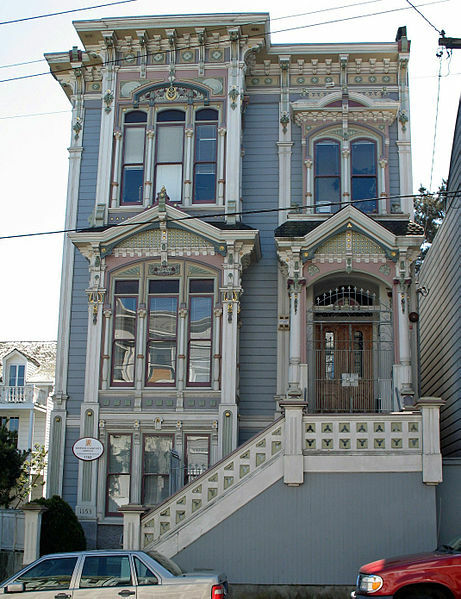 While houses from O’Farrell neighborhood don’t still exist, there are examples of Victorian architecture that did survive west of Van Ness that also helped. The Hass-Lilienthal House in San Francisco, built in 1886 and open for tours, has been a wonderful place to visit to for this purpose. Finally there is simply the tool of my imagination. As I have written elsewhere, forty years ago I lived in a house built in the 1870s or 80s in Ohio, and I used my memories from that house and my own imagination to picture and then describe the interior layout of Annie Fuller’s boarding house. Are my descriptions of the O’Farrell Street boarding house a hundred percent accurate Who knows. But if I have done my historical research sufficiently and used my imagination and writing skills effectively, I will make my readers believe in this house, picture it in their own imaginations, and want to revisit it, book after book. Happy Thanksgiving. As a little gift of thanks for the joy I get from writing about Victorian San Francisco and Annie Fuller and Nate Dawson, Maids of Misfortune will be Free on Kindle today and tomorrow, November 22-23, 2012. Fascinating! The maps and deeds, the yellowing ledgers and stark, dimensionless photographs leave partial skeletons of the past. but these do not breathe. Historical fiction, if scrupulously done, creates the only real path to lost realities, reanimating the past in fictional ghosts. I suspect that the lodgers in a boarding house on the 400 block of O’Farrell, on foggy, late nights in the late 1099’s, were alarmed and intrigued by the flitting, transparent presence of a young woman named Annie.